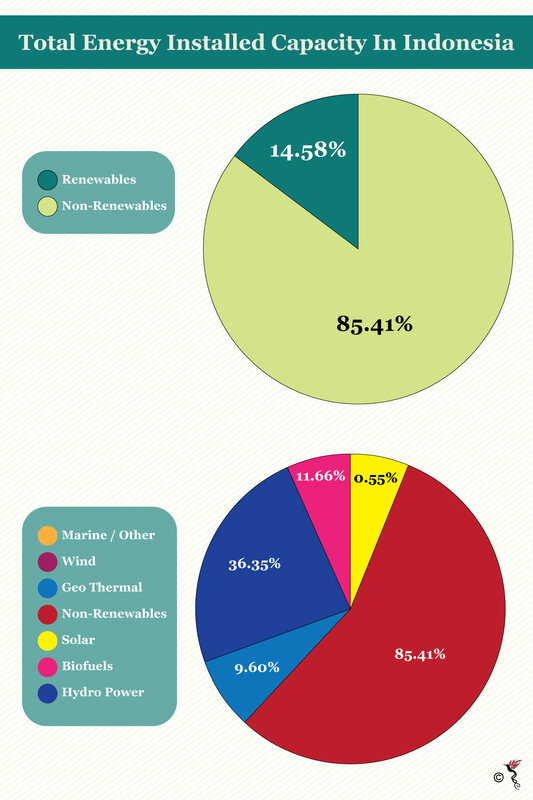 Indonesia is the largest energy consumer among all ASEAN member states. With over 261 million people living in the country, energy demand in the archipelagic country is growing rapidly. It currently has a total installed energy capacity of 57.6 gigawatts (GW). Although dependence on fossil fuels has increased in recent years, Indonesia has started adding more renewable capacity to its energy mix. According to International Renewable Energy Agency (IRENA), Indonesia aims to convert 23 percent of its total energy supply to renewables by 2025, and 31 percent by 2050, as part of its plans to reduce greenhouse gas emissions in line with the objectives of the Paris climate agreement. The conversion of solar energy into electricity is done either directly using photovoltaic (PV) technology or indirectly using thermal technology as well as concentrated solar power (CSP). CSP involves using mirrors or lenses to concentrate the solar energy and convert this into heat. The heat is used to create steam, which drives a turbine to generate electricity. Solar energy in Indonesia offers great potential to the renewable capacity. IRENA’s Roadmap for a Renewable Energy Future (REmap) programme identified potential for 47 gigawatts (GW) of installed capacity by 2030. This includes plans to use solar energy to provide electricity to nearly 1.1 million households in remote areas that do not have electricity. According to IRENA, solar energy is expected to be used on a significant scale by 2030 in three ways: in utility-scale plants, on residential and commercial rooftops, and in off-grid settings for to replace costly diesel-powered generation. It is assumed that this potential will be developed by 2030 through efforts by the government and Perusahaan Listrik Negara (PLN). Nevertheless, solar energy development in Indonesia is still sluggish. “The current development of solar power is still very limited at around 0.08 GWp (80 MWp) consisting of stand-alone solar photovoltaic located in remote areas and some on-grid larger capacity up to five MW has also been installed in Kupang, East Nusa Tenggara,” stated Han Phuomin, Energy Economist for Economic Research Institute for ASEAN and EAST ASIA (ERIA) in an e-mail correspondence with The ASEAN Post. This is a far cry from the Indonesian government’s expectation of achieving 6,500 MW solar energy development by 2025. According to PricewaterhouseCoopers's (PwC) "Power in Indonesia, Investment and Taxation Guide 2016", there are challenges to solar energy development in Indonesia. These challenges include the lack of appropriate regulatory support as well as the need for greater Government, investor and stakeholder coordination on issues amongst others. “The level of solar investment is still limited in Indonesia due to frequent changes in policy to support renewable energy up-take such as of feed in tariff (FiT) rate. However, its future potential of using solar is feasible if the government implement policies to support electrification ratio in faster way rather than waiting the grid connected supply. Solar is cost competitive when compared to current diesel power generation,” stated Han.